Our gearmotor modular system is oriented towards the diversity of your application areas. Chose your ideal drive from standard, servo, adjustable, stainless steel, or explosion-proof gearmotors. How does a gearmotor work? What types of gearmotor are available? 230 V or 400 V gearmotors? Since then, the gearmotor has been developed further and further and new types of gear unit have been invented. In terms of motors, direct current technology has become less important, therefore gear units are nowadays most often combined with AC motors or servomotors. The central role in the gearmotor is performed by the gear unit and its gear unit stages, the gear pairs. These features transmit the force of the motor from the input end to the output end. The gear unit therefore functions as a converter of speed and torque. In most application cases, the gear unit slows down the rotational speed of the motor while at the same time transmitting significantly higher torques than the electric motor alone could provide. With that in mind, the design of the gear unit determines whether a gearmotor is suitable for light, medium or heavy loads and for short or long power-applied hours. 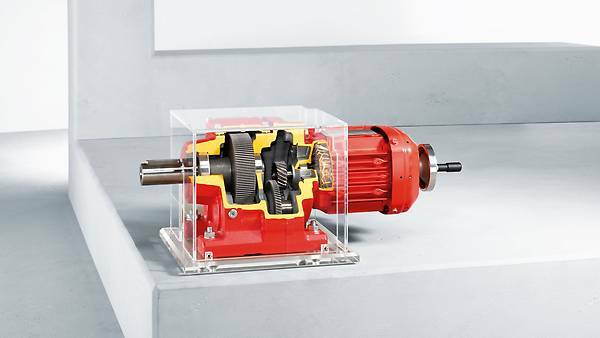 We refer to a reduction ratio or gear ratio based on whether a gear unit steps down or steps up the incoming speed from the motor (called the input speed). The speed ratio i between the input speed and output speed of the gear unit serves as a measure of this. Another important measured variable for a gearmotor is the maximum torque on the output side. This torque is specified in newton meters (Nm) and is the measurement for the force of the gearmotor and the load that it can move with that force. The primary factor in determining the type of gearmotor is the direction of flow force of the gear unit. There are three different basic designs in this regard: Parallel-shaft gear units, right-angle gear units, and planetary gear units. The possible applications for gearmotors are exceptionally varied. Without gearmotors, the entire global economy would come to a standstill. In industrial production, they drive a countless number of conveyor lines, lift and lower loads, and move the widest variety of different goods from A to B in all types of systems. In the automotive industry you can find gearmotors throughout the manufacturing process, from the press shop to final assembly. Likewise in the beverage industry where they move bottles, packaging units, and crates of drinks and are used when filling containers or sorting empty goods. Every intralogistics company relies on drives, whether they have to store, sort or supply goods. The same with airports, where nothing would work without gearmotors and passengers would spend futile hours waiting for their bags at baggage claim. Handling machines and robots, which require a high level of dynamism and accuracy, would be unthinkable without servo gearmotors. Last but not least, there would be no such thing as fairground rides in the entertainment industry and the feeling of butterflies in your stomach on the roller coaster would probably be unheard of. What does the 230 V / 400 V voltage specification on the nameplate mean? If you search for a gearmotor for a specific nominal voltage online, you will soon find that there is a very broad selection available. Most people are looking for 230 V gearmotors or 400 V gearmotors. Generally, two voltages are specified for a gearmotor, for example “230 V / 400 V.” The lower voltage, 230 V, specifies that one phase of the installed motor (one motor winding) has a maximum load of 230 V. 400 V is the maximum voltage that the motor’s outer conductor can handle. Essentially, operation on a 400 V grid requires a star connection, whereas a delta connection should be used for the lower voltage (230 V). The nameplate that every gearmotor must have has to list the permitted voltage range for the rated data required. Most gearmotors’ nameplates list a slightly larger voltage range because electrical machines are allowed to have voltage fluctuations within a standardized tolerance of +/- 5%. The combination options for our gearmotors are as diverse and extensive as their possible uses. 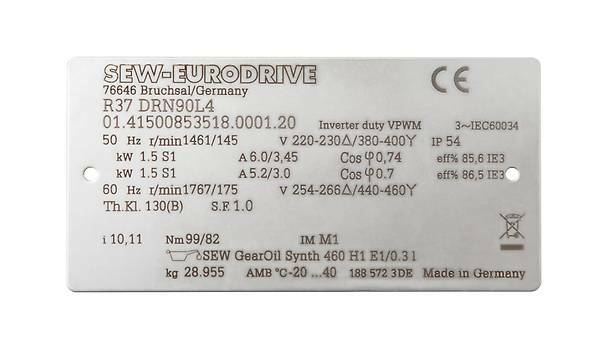 Thanks to the complete modular system developed by SEW‑EURODRIVE, our customers have access to millions of options and can find their customized product solution for any requirement. The objective of the modular system is to be able to combine as few components as possible into the greatest possible range of end products. Gearmotors from SEW‑EURODRIVE are broken down into the following categories: standard gearmotors, servo gearmotors, electrified monorail system gearmotors, variable-speed gearmotors, stainless steel gearmotors, and explosion-proof gearmotors. Standard gearmotors feature an impressive variety of types, the ideal graduation over a multitude of sizes, and the widest range of designs. That makes them an essential heavy-duty drive that is especially suited for production and logistics. Depending on the level of gear unit graduation, they can achieve high torques of up to 50,000 Nm. Power, speed, and precision These are the key features of servo gearmotors. Here too, our modular system is the key to unlocking extensive combination options and makes the most diverse variety of gear unit and motor constellations in this field possible. The ideal gearmotor can be created for every requirement. Whether you combine our PF.. planetary servo gear unit or BF.. helical servo gear unit with CMP synchronous servomotors, DRL.. asynchronous servomotors, or DR.. AC motors: Every time, the special interplay between motor and gear unit gives you the exact drive response tailored to your application and requirements. 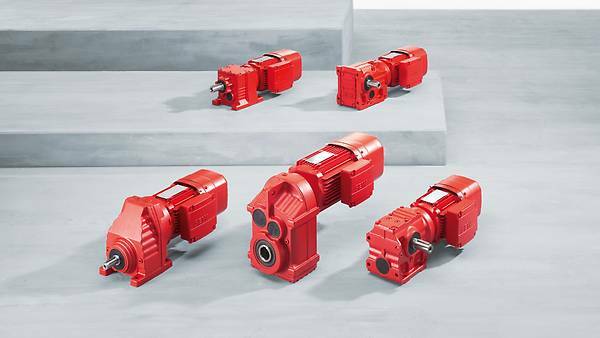 You can also create versatile combinations with the gear units from our standard range and our servomotors to configure and optimize the individual drives in your plant. For applications in which the drive speed has to be seamlessly adjusted, our mechanical variable speed gearmotors come into play. These are the type of requirements for simple conveyor belts or agitators, for instance, with speed levels that constantly have to be adapted to different process sequences. The speed can be seamlessly adjusted either using a handwheel or remote control. For applications in cleaning-intensive hygiene areas, the gearmotor has to endure the chemicals used and moisture. Our acid and alkaline-resistant stainless steel gearmotors are designed for exactly this purpose. Their surface, which is optimized for cleaning, and their fanless design also ensures that no dirt can become lodged in any recesses. And you do not lose anything in terms of power. Whether you choose the RES.. stainless steel helical gearmotor or the KES.. stainless steel helical-bevel gearmotor design: These gearmotors are especially robust, durable and maintainable and the helical-bevel gear unit in particular does not take up much space. The majority of our standard gearmotors and servo gearmotors are available as explosion-proof gearmotors that comply with local regulations throughout the world. They are therefore powerful and safe drives that provide the high performance required even in potentially explosive atmospheres with air and gas or air and dust mixtures.